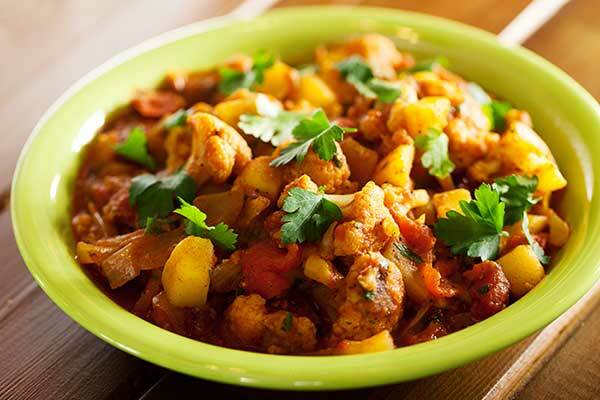 A potato free version of Aloo Gobi that delivers big flavor! Heat 2 teaspoon of oil in a pan on medium heat. Add cauliflower florets and fry for 2-3 minutes and then add the sliced parsnips. Fry on medium-low flame for 10-12 minutes till parsnips and cauliflower have some brown spots on them. In the same pan heat 1.5 teaspoon of oil on low-medium heat and add cumin seeds and let them crackle. Add the onions and cook for 2-3 minutes till translucent. Add the ginger-garlic paste and cook for another 3-4 minutes or till the raw smell goes away. Cover the pan and let the masala cook for 5-6 minutes and then add the parsnips and cauliflower to it and mix. Add chopped cilantro leaves and give a good mix. Add garam masala and cook the parsnip and cauliflower on medium-low heat for 5-6 minutes. Add salt and cover the pan and cook more additional 6-8 minutes on low flame or till the parsnip and cauliflower are tender but not soggy.